The epoxy coating lining is made up from two parts, a base and a hardener. The pot life is determined by the manufacturer to allow a reasonable time to perform the coating application. The epoxy coating is prepared and loaded into the pipeline between two MOGSiLspecially modified polyurethane pipeline applicator scrapers. 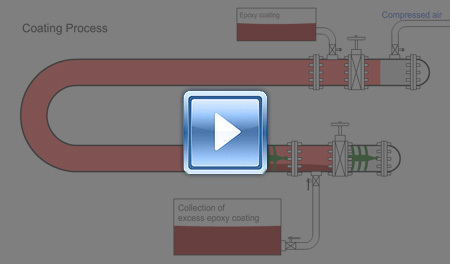 The process of applying the coating to the entire pipeline wall is by means of extrusion. The internal pipeline coating desired film thickness is achieved through a predetermined constant drive pressure and velocity throughout the pipeline. The internal pipeline coating application specification calls for a minimum of three coating runs to reach the desired dry film thickness average of 8 mils or 200 microns. In between each coating run, dry particulate free air is pushed from one end of the pipeline to the other, to ensure that the solvents evaporate from the coating. The average drying time between coating runs is 16 hours. On completion of the coating runs, the inspection of the Dry Film Thickness (DFT) is taken at predetermined points along the pipeline. The tests are performed across the diameter of the pipeline. MOGSiL utilise industry proven DFT testing methods during the coating evaluation and inspection.